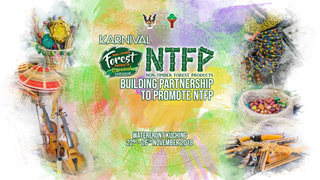 From Lawas in the north to Kapit in the central region and Lundu all the way in the southern tip, representatives of the many indigenous rural communities from all over Sarawak will travel far and wide to gather at the Non-Timber Forest Products (NTFP) Carnival Sarawak 2018 from the 22nd to 26th November 2018 at the Kuching Waterfront. In the third edition of this annual event organised by Forest Department Sarawak, the communities will market and promote their non-timber handmade products that range from various handicrafts, decorations, musical instruments to food products, herbs and traditional medicine at the event. All profits will go directly to the communities. Other than getting the rare opportunity to purchase handmade non-timber forest products from around Sarawak, do come and join us at the NTFP Carnival for a variety of exciting activities such as musical night, singing competition, lucky draws and more!